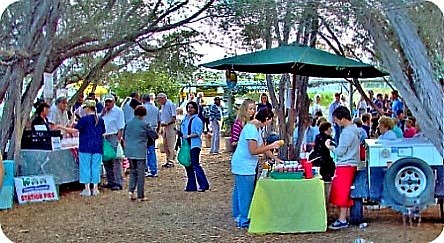 Some 17 years ago Rose Brettell and Susan Garner initiated the Wild Oats Farmers' Market. 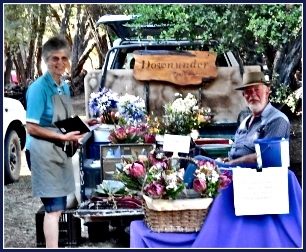 Their aim was to give local farmers an appropriate physical space to sell their own produce direct to the public, to take away the normally impersonal process of purchasing "groceries" and connect "townies" with "country". 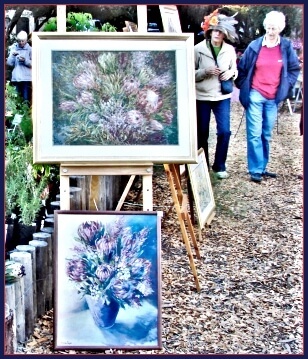 Every Saturday , just off the N2 highway, (at the Engen garage turnoff on the George side of Sedgefield) in a secluded area close to the Swartvlei lagoon, stalls of all kinds are set out in the sheltering cover of Australian Myrtle trees. 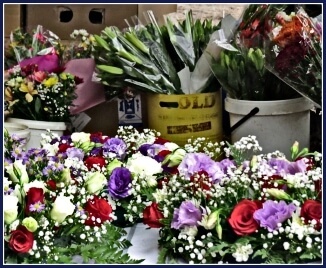 The real value of buying local means consumers get the freshest produce - in this case picked the day before and even the same morning as it is placed on the stalls and the farmers get full value for their efforts without having to forfeit so much to middlemen and transport costs. Faces and personalities are connected to quality home-made products of all kinds that are presented with authenticity and pride. The choice of food is staggering, fresh fruit and vegetables, fish and meat of all kinds, raw, smoked, dried, pickled and cooked. English and Continental breakfasts, samoosas, sushi, and the best German bratworst rolls I've ever tasted - the secret recipe of the stall owner - you'll find them nowhere else! Varieties of sweet and savoury pies, cakes small and large, tasty towers and simple cupcakes, biscuits, jams and preserves, cheeses, breads made with stone ground flour, Italian sandwiches, organic olives, nuts, smoothies and fruit juices are available. Many cultures are represented. 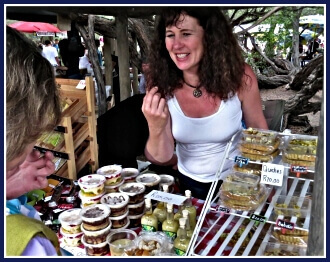 There are delicious German cakes and cured meats, Italian breads and pastas, South African biltong, vetkoek and dried fruit, Greek desserts, Indian samoosas and chilli bites, Dutch cheeses –this list is by no means exhaustive. 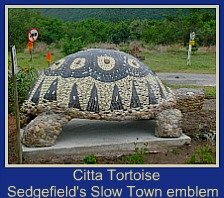 No wonder it is a favourite meeting place for breakfast for the locals and tourists all along the Garden Route! 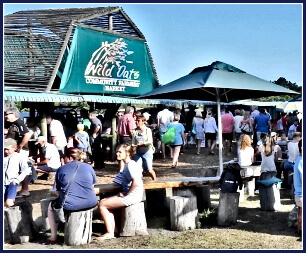 Rustic dining tables and chairs in the form of upended chopped logs and larger ones used as tables enable visitors to sit down and eat under shady trees. Holidaymakers - you can buy ready cooked delicious meals here and not have to cook for a week! Nothing is mass produced so get there early to avoid disappointment! Socialised dogs on leads are welcome too. 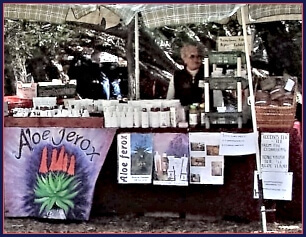 Then there are home-made herbal soaps, aloe based creams and lotions, cut flowers, fresh herbs, indigenous plants, proteas and fynbos as cut flowers and garden plants. CLICK ON THE BANNER BELOW TO LEARN HOW TO TURN YOUR HOBBY INTO A SUCCESSFUL BUSINESS! 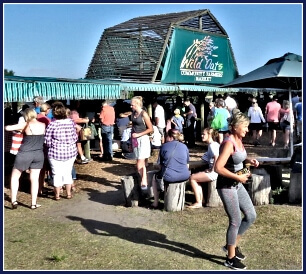 Unless they have a pre-booked gig, the popular Eden Minstrels are at the entrance of the Wild Oats Market every Saturday to entertain the folks as they arrive. Unceasingly they draw crowds that stop to enjoy their style of music. 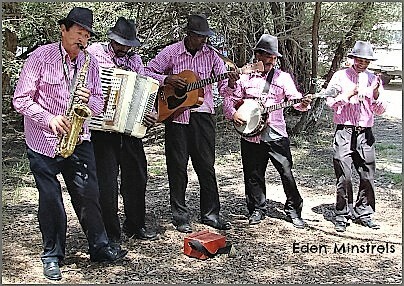 To book the Eden Minstrels for an event contact Norman Mark on 078 261 2395. 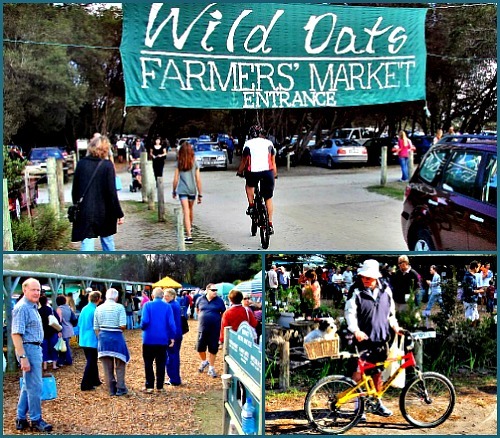 Wild Oats Farmers Market has proved to be a successful formula. 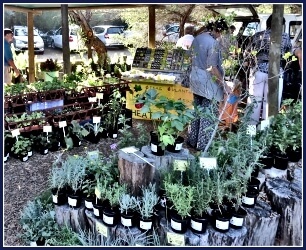 In a beautiful rural setting it provides a shopping experience that is an enjoyable and relaxing outing for the whole family.